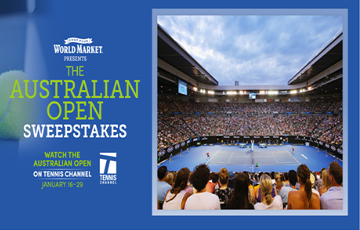 World Market Australian Open Sweepstakes – Win a trip to Australia & more! ELIGIBILITY – Open to legal residents of the US & DC who are 21 years of age or older at the time of entry. SWEEPSTAKES ENTRY PERIOD – Begins 12:01 a.m. ET 1/04/17, ends 11:59 p.m. ET 1/29/17. PRIZES – Grand Prize (1): A trip for winner and one guest to Melbourne, Australia. Trip consists of round-trip coach calss air transportation from a major U.S.gateway airport nearest winner’s residence to Melbourne, Australia, six (6) days and five (5) nights hotel accommodations, ground transpotation to/from airport and hotel, admission to the Penguin, Koala & Kangaroo Tour (subject to availablity) for winner and guest (exact date and time of tour to be determined by Sponsor, in its sole discretion), a dinner for winner and guest (awarded in the form of a $150 check), admission for winner and guest to two (2) days of the Austalian Open (winner and guest will both receive wither day or night sessions, to be setermined by Sponsor, in its sole discretion). and a $1,000 World Market Gift card for winner only. Approximate Retail Value (ARV) of Grand Prize package: $8,700.00. 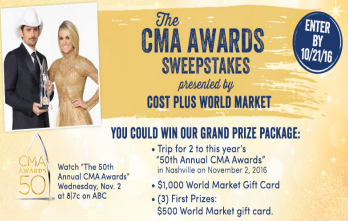 World Market CMA Awards Sweepstakes – Win a trip to the CMA Awards in Nashville & more! Win a trip to the CMA Awards in Nashville & more! ENTRY LIMIT – You may only use one (1) email address to enter the Promotion. All entries must be received by 11:59 p.m. ET on 10/21/16 to be eligible. For the purposes of this Promotion, a day is understood to begin at 12:00 a.m. ET and end at 11:59 p.m. ET that same day. To receive bonus entries: Once you have signed up for the promotion online, we will give you a unique link (bitly) that you can share via email, social media post or text. For every unique person who signs up from your unique link, you will get an additional entry into this contest. You may only refer persons with whom you have an existing relationship and who are eligible to enter the Promotion. You will receive one (1) bonus entry for each unique referred friend who uses the link and signs up for the promotion throughout the Promotion Period. ELIGIBILITY – The CMA Awards Sweepstakes presented by Cost Plus World Market (the “Promotion”) is open to legal residents of the fifty (50) United States and District of Columbia who are 21 years of age or older at the time of entry (excluding residents of Puerto Rico, and all other U.S. territories and possessions). SWEEPSTAKES ENTRY PERIOD – The Promotion begins at 12:01 a.m. Eastern Time (“ET”) on 10/01/16 and ends at 11:59 p.m. ET on 10/21/16. PRIZES – GRAND PRIZE (1): A trip for winner and one (1) guest to Nashville, TN to attend the CMA Awards scheduled to take place on November 2, 2016. Trip consists of round-trip coach class air transportation from a major U.S. gateway airport nearest winner’s residence to Nashville, TN, four (4) days and three (3) nights hotel accommodations (exact hotel to be determined by Sponsor, in its sole discretion), ground transportation to/from airport and hotel, two (2) tickets to the CMA Awards, ground transportation to/from airport and hotel and CMA Awards, and a $1,000 World Market Gift Card for winner only. Approximate Retail Value (“ARV”) of Grand Prize package: $4,567.50. 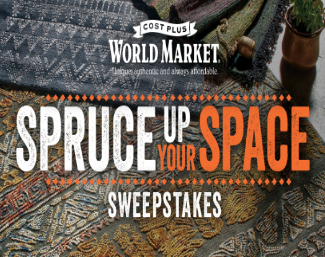 World Market’s Spruce Up Your Space Sweepstakes – Win a $5,000 World Market gift card! Win a $5,000 World Market gift card! 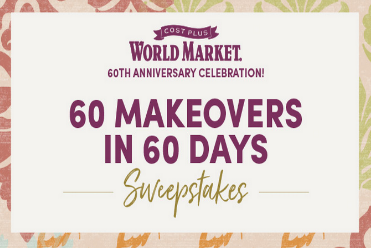 ELIGIBILITY – World Market’s Spruce Up Your Space Sweepstakes is open to legal residents of the fifty (50) United States and the District of Columbia who are 18 years of age or older at the time of entry. SWEEPSTAKES ENTRY PERIOD – The Sweepstakes begins on Aug. 8, 2016 and ends on Sept. 30, 2016. PRIZES – Grand Prize (1): A $5,000 World Market Gift Card and a personal room design consultation with TV design celebrity Nicole Curtis. ARV: $5,000. First Prizes (3): A $1,000 World Market Card. ARV of each first prize: $1,000. 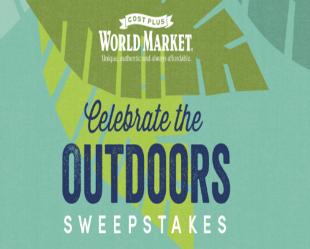 Cost Plus World Market Celebrate the Outdoors Sweepstakes – Win a trip to Maui & more! Win a trip to Maui & a $1,000 World Market gift card! ELIGIBILITY – The Cost Plus World Market Celebrate the Outdoors Sweepstakes is open to legal residents of the fifty (50) United States and District of Columbia who are 21 years of age or older at the time of entry (excluding residents of Puerto Rico, and all other U.S. territories and possessions). SWEEPSTAKES ENTRY PERIOD – The Promotion begins at 12:01 a.m. Eastern Time (“ET”) on 04/18/16 and ends at 11:59 p.m. ET on 06/17/16. PRIZES – GRAND PRIZE (1): A trip for winner and up to three (3) guests to Maui, Hawaii. Trip consists of round-trip coach class air transportation from a major U.S. gateway airport nearest winnerâ€™s residence to Hawaii, six (6) days and five (5) nights in a vacation home rental (exact vacation home rental to be determined by Sponsor, in its sole discretion), ground transportation to/from airport and vacation home, admission on the “Road to Hana Tour” excursion (subject to availability) for winner and guests aboard a custom cruiser with giant viewing windows where they will have the opportunity to take photos of Hawaiian waterfalls, religious, cultural and biological points of interest (i.e., flora and fauna), a picnic style lunch and unlimited non-alcoholic beverages for winner and guests while on excursion, $300 for winner only (awarded in the form of a check) which may be used towards the cost of a rental car while on trip, and a $1,000 World Market Gift Card for winner only. Approximate Retail Value (“ARV”) of Grand Prize package: $9,472.60. 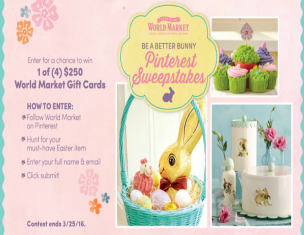 World Market’s Be a Better Bunny Pinterest Sweepstakes – Win a $250 World Market gift card! Win a $250 World Market gift card (4 winners)! ELIGIBILITY – World Market’s Be a Better Bunny Pinterest Sweepstakes is open to legal residents of the fifty (50) United States and District of Columbia (excluding Puerto Rico and all other United States territories and possessions) who are 18 years of age or older at the time of entry. SWEEPSTAKES ENTRY PERIOD – Sweepstakes begins at 12:01 a.m. Eastern Time (“ET”) on 3/11/16 and ends at 11:59 p.m. ET on 3/25/16. PRIZES – (4) GRAND PRIZES: $250 World Market Gift Card. Cost Plus World Market Ultimate Football Fan Party Sweepstakes – Win a $2,000 World Market gift card & more! Win a $2,000 World Market gift card & more! ENTRY LIMIT – Limit one (1) entry per person per day throughout the Promotion Period. 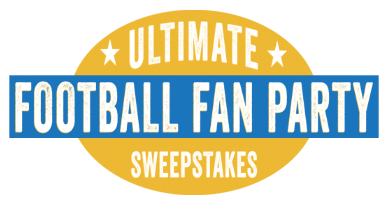 ELIGIBILITY – The Cost Plus World Market Ultimate Football Fan Party Sweepstakes is open to legal residents of the fifty (50) United States and District of Columbia who are 18 years of age or older at the time of entry. SWEEPSTAKES ENTRY PERIOD – The Promotion begins at 12:01 a.m. Eastern Time (“ET”) on 01/09/16 and ends at 11:59 p.m. ET on 01/29/16. PRIZES – GRAND PRIZE (1): A $2,000 World Market Gift Card, one (1) case of twelve (12) Torani flavored Syrups, one (1) case of twelve (12) Krave Jerky, one (1) case of twelve (12) Ghirardelli Chocolate, and one (1) case of twelve (12) Columbus Salame. Approximate Retail Value (“ARV”) of grand prize package: $2,384.00. FIRST PRIZES (3): A $500 World Market Gift Card. ARV of each first prize: $500. 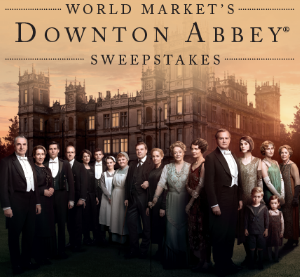 World Market’s Downton Abbey Sweepstakes – Win a trip to London & more! Win a trip to London, a $1,000 World Market gift and a tour of select Downton Abbey filming locations! ELIGIBILITY – World Market’s Downton Abbey Sweepstakes is open to legal residents of the fifty (50) United States and District of Columbia who are 21 years of age or older at the time of entry (excluding residents of Puerto Rico, and all other U.S. territories and possessions). SWEEPSTAKES ENTRY PERIOD – The Promotion begins at 12:01 a.m. Eastern Time (“ET”) on 11/26/15 and ends at 11:59 p.m. ET on 1/8/16. PRIZES – GRAND PRIZE (1): A trip for winner and one (1) guest to London, England to attend a private chauffeured tour of select Downton Abbey filming locations and a tour of Highclere Castle. Trip consists of round-trip coach class air transportation from a major U.S. gateway airport nearest winner’s residence to London, seven (7) days and six (6) nights standard hotel accommodations (one (1) room, double occupancy), ground transportation to/from airport and hotel, luxury car pickup at hotel in London to Highclere environs, a private chauffeured tour of Downton Abbey filming locations, a tour of Highclere castle, lunch for winner and guest on the day of the tours, a copy of the Downton Abbey script signed by members of the cast for winner only, and a $1,000 World Market Gift Card for winner only. Approximate Retail Value (“ARV”): $10,500. 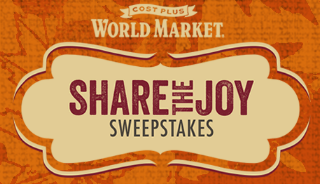 World Market’s Share the Joy Sweepstakes – Win a $2,000 World Market gift card & more! Win a $2,000 World Market gift card & $2,000 for the non-profit organization of your choice (4 winners)! ELIGIBILITY – World Market’s Share the Joy Sweepstakes is open to legal residents of the fifty (50) United States and District of Columbia who are 18 years of age or older at the time of entry (excluding residents of Puerto Rico, and all other U.S. territories and possessions). SWEEPSTAKES ENTRY PERIOD -The Promotion begins at 12:01 a.m. Eastern Time (“ET”) on 11/2/15 and ends at 11:59 p.m. ET on 11/25/15. PRIZES – GRAND PRIZES (4): A $2,000 World Market Gift Card for winner and Sponsor will award $2,000 to a non-profit organization of winner’s choice. Approximate Retail Value (“ARV”) of each Grand Prize package: $4,000. 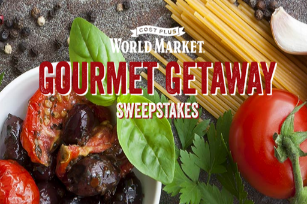 Cost Plus World Market Gourmet Getaway Sweepstakes – Win a trip to Italy & more! Win a trip to Italy & more! ELIGIBILITY – Cost Plus World Market Gourmet Getaway Sweepstakes is open to legal residents of the fifty (50) United States and District of Columbia who are 21 years of age or older at the time of entry (excluding residents of Puerto Rico, and all other U.S. territories and possessions). SWEEPSTAKES ENTRY PERIOD – The Promotion begins at 12:01 a.m. Eastern Time (“ET”) on 8/31/15 and ends at 11:59 p.m. ET on 10/2/15. PRIZES – GRAND PRIZE (1): A trip for winner and one (1) guest to Naples, Italy. Trip consists of round-trip, coach class air transportation from a major U.S. gateway international airport nearest winner’s residence to Naples, Italy, seven (7) days and six (6) nights hotel accommodations in Sorrento, Italy (one (1) room, double occupancy), round-trip ground transportation to/from airport and hotel, one (1) day excursion to Pompeii, a guided tour of a local (Sorrento area) limoncello factory, a Sorrento city and market tour, a guided tour of Capri, one (1) Italian cooking class, dinner for winner and guest in Sorrento for two (2) nights, round-trip ground and boat transportation to/from each of the excursion and tour destinations throughout the trip, gratuities for each excursion and tour destination specified above as being provided (awarded in the form of a $300 check), and a $1,000 World Market Gift card for winner only. Approximate Retail Value (“ARV”) of Grand Prize: $15,000.